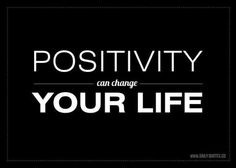 In the past, I have struggled with being positive. While I would consider myself a good person, I wasn’t always the most positive. As I matured, I realized that my negativity was making me miserable. So I decided to do some soul searching. In doing this I realized that I needed to become more positive in order to become a more happy and productive person. 1. I surround myself with positive people. We all have a negative friend or family member. And while they do not mean to, they often times infect us with their negativity. Something as small as a negative remark can have a huge effect on your mood. I realized that I have to be careful of the company that I keep. Since I do not want to completely cut ties with some of my loved ones, I decided to create boundaries for myself. This allowed me to continue to have relationships with my loved ones without sacrificing my happiness. By far, this has been the most difficult yet rewarding step of the process. 2. I pray. Prayer changes things. Prayer not only changes my circumstance but also my mindset. It is kind of hard to be negative while praying. 3. I make a conscious effort to engage in activities that make me happy. I really enjoy music, fashion, decorating, organizing, and learning new things. Each day, I try to partake in an activity that makes me happy. Whenever I am having a bad day, I listen to music and my mood improves instantly. It works almost every time. 4. I cancel all negative thoughts and emotions. The opposite of negative is positive. Therefore each time a negative thought enters my mind, I replace it with a positive one. For example, each time I subconsciously tell myself that I cannot do something, I simply say: I can definitely can do that. It seems so simple however it is so effective. I learned that I needed to change the way that I speak, think, present and treat myself. 5. I give. I experience so much positivity from giving. The person on the receiving end usually benefits and I benefit by knowing that I had a positive effect on someone else’s life. Each time I give (time, money, clothing, etc. ), I walk away feeling better about myself.